Mickey Mouse, Minnie and Donald बत्तख, बतख वॉलपेपर. Mickey, Minnie and Donald at the Drive-In restaurant.. HD Wallpaper and background images in the डिज़्नी club tagged: mickey mouse minnie mouse donald duck drive-in carhop wallpaper. I wonder if Mickey flirting or command their dinner ? Good question! 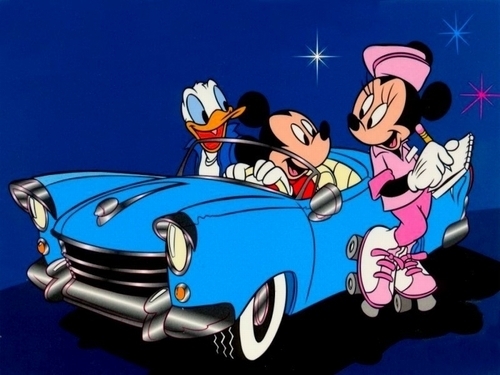 Minnie looks like she's flirting, but Mickey does look like he's just ordering dinner! But I wonder What Aböut Dönald.? His Eyes are Searching för Daisy.! I think he's hungry to see Daisy but first he wants some food!